Arterial stiffening causes an increase in the pulse pressure wave which travels through the blood vessels after each heartbeat. Pulse pressure is measured by subtracting diastolic blood pressure (low number) from systolic blood pressure (high number). (P = S - D). The formation of new glycation-induced crosslinks is slowed by several drugs and natural substances: Aminoguanidine (Pimagedine) has been studied as an inhibitor of A.G.E. 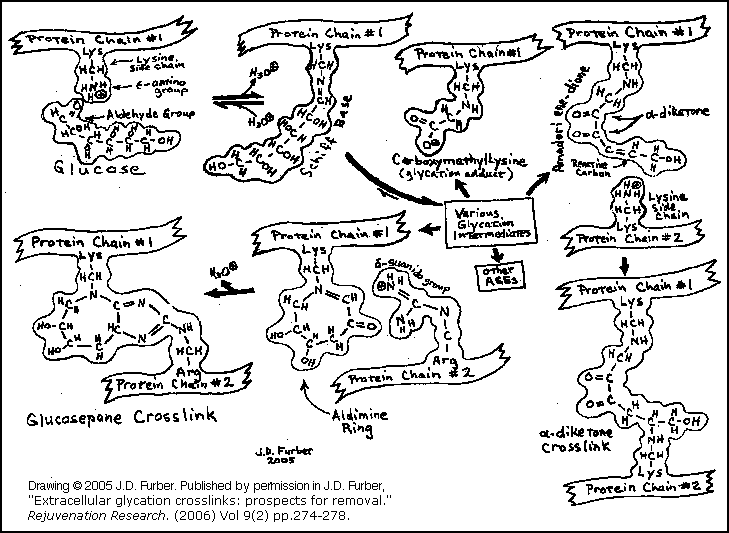 crosslink formation by Alteon Pharmaceuticals. (Alteon was later renamed Synvista Therapeutics. They have since gone out of business.) In human clinical trials, Pimagedine slowed the progression of diabetic kidney disease and retinopathy. Carnosine (beta-alanyl-L-histidine), a dipeptide formed naturally in human tissues, is also believed to inhibit the formation of crosslinks between proteins which have been glycated or carbonylated [Hipkiss]. Aspirin may also inhibit the formation of pathological A.G.E. crosslinks. For example, chronic users of aspirin have fewer cataracts [Bucala]. Alagebrium chloride (oral) has been tested in several human clinical trials in the United States. [Melton, deGroof] During the year 2000, in earlier phase 2a clinical trials, alagebrium demonstrated the ability to improve the flexibility of arteries, and to reduce arterial pulse pressure. In this double-blind trial, 62 people took a dosage of 210 mg per day for two months, while 31 other people received placebo. [Kass] In the "Diamond" clinical trial for diastolic heart failure, beginning in mid-2002, 20 people took 420 mg per day in 2 doses of 210 mg. By February 2005, over 1100 people had taken alagebrium (or PTC) in various clinical trials. So far, the safety profile of the drug appears to be excellent in human subjects. However, in December 2004, a study feeding alagebrium to lab rats for two years, found an increased rate of liver cell alterations in male rats, but not the females. This strain of lab rat (Sprague-Dawley) often develops liver cell alterations spontaneously, without drugs. The increased rate is comparable to effects caused in Sprague-Dawley rats by other, already approved drugs, such as the statins. These abnormalities are not necessarily expected in humans. Following further study, FDA allowed clinical trials to proceed. No harmful interactions with other drugs have been observed. Any subjects who had been already taking other blood pressure medications continued on their previous medications in addition to taking alagebrium. Benefits of alagebrium were observed in addition to any benefits from the other blood pressure medications. In December 2004, Synvista Therapeutics (Alteon) announced a phase 2 clinical trial of alagebrium to reverse erectile dysfunction. Subjects were slated to be taking 200 mg, once per day. Lowering systoloic blood pressure if it was too high. Partial reversal of pathological heart enlargement and stiffening associated with DHF (diastolic heart failure). Increased flexibility of large muscles when performing stretching exercises. Reduced or eliminated joint pain when walking or exercising. Reduced or eliminated peripheral neuropathy (tingling in the fingers or toes). This might be due to improved capillary circulation better nourishing the peripheral nerves. Perhaps the nerve sheath is being made more flexible so that it no longer squeezes the nerves. Or it could be due to improvements in inflammation or redox status. Improved bladder elasticity: Several senior subjects reported that they could hold longer and more easily before needing to urinate. They noticed that they did not need to get up as often in the middle of the night to urinate, and that they could sit through long meetings and car trips. In a young person, the walls of the bladder are elastic, so the bladder expands as it fills with urine. Age-related crosslinking stiffens the bladder walls, reducing its capacity to expand, so many older people notice that they need to urinate more frequently than they did when they were young. The crosslink breakers appear to restore flexibility and bladder capacity. Thiazolium breakers, such as alagebrium, target diketone crosslinks, and have proven beneficial in early clinical trials. However, during aging or diabetes, other kinds of chemical crosslinks slowly accumulate as a result of glycation. These other crosslinks, such as glucosepane, are not broken by thiazolium drugs. We would like to discover new drugs, able to break glucosepane crosslinks. These could be used in addition to thiazolium drugs. The combination could break all of the major pathological glycation crosslinks which accumulate in aging and diabetes. The results could be much more extensive restoration of tissue elasticity than that provided by thiazolium breakers alone. Melton L. "AGE Breakers," Scientific American. p. 16 (July 2000). Borek C. "AGE Breakers," Life Extension Magazine. (Life Extension Foundation, Aug 2001). Cerami A. "Pharmaceutical intervention of advanced glycation endproducts", in Ageing vulnerability: causes and interventions. Novartis Bulletin. Symposium 235 (2000). Melton L. AGEing: Breaking the bonds, Novartis Bulletin. (2000). Furber JD. "Repairing Extracellular Aging and Glycation,"
The Future of Aging: Pathways to Human Life Extension Ed. by G.M. Fahy, et.al. (Springer Science+Business Media B.V. 2010) DOI 10.1007/978-90-481-3999-6_19. Furber JD. "Extracellular glycation crosslinks: prospects for removal." Rejuvenation Research. (2006 Summer); Vol. 9(2): pp.274-278. PMID: 16706655. Publisher's web site Mary Ann Liebert. Full text PDF from the author. deGroof RC. " Remodeling of Age- and Diabetes-Related Changes in Extracellular Matrix", Proceedings of 10th International Association of Biomedical Gerontology. New York Academy of Sciences. (2003). Cerami A, Vlassara H, Brownlee M. "Glucose and Aging", Scientific American. 256: 90 - 96 (1987). Bucala R, Cerami A. "Advanced Glycosylation: Chemistry, Biology, and Implications for Diabetes and Aging," Advances in Pharmacology, Volume 23. (1992) pp. 1 - 34. Kim T, Spiegel DA. "The Unique Reactivity of N-Phenacyl-Derived Thiazolium Salts Toward alpha-Dicarbonyl Compounds." Rejuvenation Research 2013 Feb;16(1):43-50. doi: 10.1089/rej.2012.1370. PubMed PMID: 23186164. P Ulrich, X Zhang. "Pharmacological reversal of advanced glycation end-product-mediated protein crosslinking," Diabetologia. 40: S157-S159 (1997). S Vasan, Xin Zhang, Xini Zhang, A Kapurniotu, J Bernhagen, S Telchberg, J Basgen, D Wagle, D Shih, I Terlecky, R Bucala, A Cerami, J Egan, P Ulrich. "An agent cleaving glucose-derived protein crosslinks in vitro and in vivo," Nature. 382: 275 - 278 (18 July 1996). Castellani RJ, Harris PL, Sayre LM, Fujii J, Taniguchi N, Vitek MP, Founds H, Atwood CS, Perry G, Smith MA. "Active Glycation in Neurofibrillary pathology of Alzheimer's Disease: N(epsilon)-(Carboxymethyl) Lysine and Hexitol-Lysine", Free Radical Biology & Medicine Vol. 31 (2), pp. 175-180, (2001). M Asif, J Egan, S Vasan, G N Jyothirmayi, MR Masurekar, S Lopez, C Williams, R L Torres, D Wagle, P Ulrich, A Cerami, M Brines, T J Regan. "An advanced glycation endproduct cross-link breaker can reverse age-related increases in myocardial stiffness," PNAS. 97(6): 2809-2813 (14 March 2000). Hipkiss AR, Brownson C, Carrier MJ. "Carnosine, the anti-ageing, anti-oxidant dipeptide, may react with protein carbonyl groups," Mech Ageing Dev. 2001 Sep 15;122(13):1431-45. Legendary Pharmaceuticals is a participant in the Amazon Services LLC Associates Program, an affiliate advertising program designed to provide a means for sites to earn advertising fees by advertising and linking to amazon.com. Rev. 25 July 2015. © 2000 - 2015 by John D. Furber. All rights Reserved.